Could this possibly be a Zuni Bracelet? In 1971 my cousin who lived in LA gave me a bracelet. Only recently was it noted to me that it was a Zuni design. Upon close inspection an inscription was found on the inside. The letters S P Boone with Zuni below. Was there a Zuni artist with this hallmark? I am hoping you can assist me in this search to see if there is value in the bracelet. Thanks in advance for any assistance you can give. More from Janice…………In 1971 I was gifted by my cousin in LA this bracelet. The only reference as to its origin is I remember his saying it was one of some items he had picked up while on a trip to Arizona or New Mexico. I had admired it and a couple of other pieces. He gave all the pieces to me. He passed away 6 years ago, so I cannot get any background info from him. The bracelet spent most of the last 42 years tucked into my jewelry box. Recently I wore the bracelet for a special occasion and a friend noted it looked to be a Zuni bracelet. I had no clue what that meant so she told me it was a quality piece of work by the Zuni tribe. She looked at the bracelet and the inside had the initials S P Boone, with the ‘ne’ portion being linked together. Below is zuni. I know nothing other than what little I have researched online. 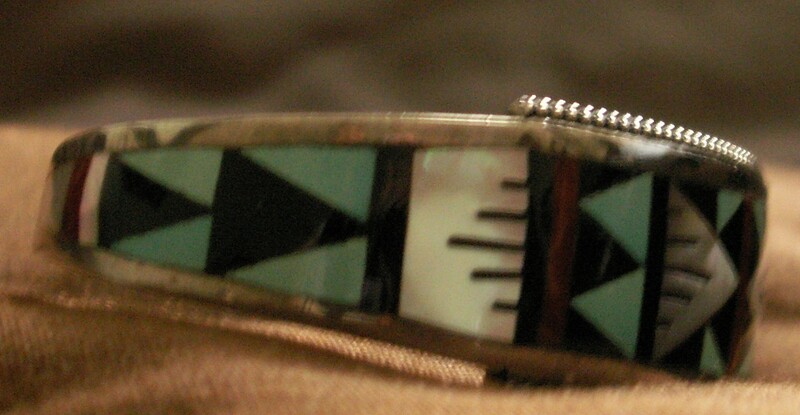 The bracelet displays a design I see on many of the inlaid Zuni pieces. Is anyone familiar with the artist, S P Boone? Although I have no information or knowledge about an SP Boone, the name Boone is a common Zuni name. We have a number of fetish carvings from the Boone family such as this jet horse by Emery Boone.